But first, please forgive the fact that I have not addressed you since I was a child. (Exception: I frequently say your name in vain and have found its usage quite diverse for emotional expression.) Anything I might have said to you not in vain, must have been written at an early age when I did not possess mature concepts such as skepticism. Also, I ought to make it clear that I do not believe in you. I have, however, had the experience of being saved. When I was 12 years old I looked up the word “atheist” and found myself. My higher power is and shall remain the Oxford American Dictionary. I do recognize the fact that millions of people on this planet allow for your existence and that, although this has caused countless wars over the eras, it has also fostered a sense of reverence and peace in many devoted hearts. Because of your supreme influence in these ways, I have taken it upon myself to write this letter. Please do not take offense. What I need to tell you is this: I have made the most perfect cup of coffee. On this 15th day of September in the, ahem, year of our Lord 2009, I carefully pressed my French press into its fitted glass sleeve and hence poured the most perfect cup. The beans can be traced to Lighthouse Roasters in Seattle, Washington and to Ethiopia before that. The careful pressing skills can be traced to Portland, Oregon, where coffee obsession was my third parent. 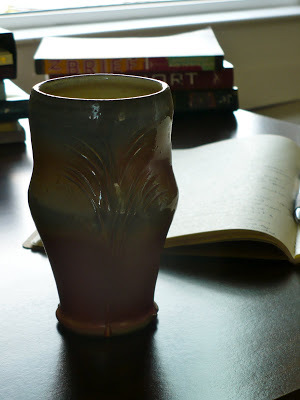 The physical cup (shown here) can be traced to Joy Tanner of Bad Creek, potter extraordinaire. The beans, the French press, my uber-swift pressing skills, and the mug I poured it all into cannot be traced to you. Understanding that you are the only being-that’s-not-a-being who is allowed to make the most perfect anything, it seemed I ought to let you know about my perfect cup of coffee. I have no suggestions for how to deal with this—perhaps someone in your PR department can handle the problem—but you’re God, after all. I’m sure you’ll figure something out.